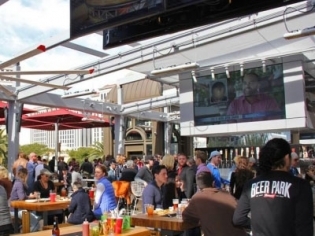 Beer Park, on the rooftop of the Paris Hotel, is on a 10,000-square-foot deck overlooking the Bellagio Fountains and with a great view of the Eiffel Tower. This open air atmosphere has something for everyone: 36 beers on tap, a full menu with a focus on grilled items with a beer essence, DJs and live music in the evenings, even breakfast served during morning sporting events. Enjoy the lounge area with pool table and a giant Jenga game. This is a great place to sit and watch sporting events, grab a beer and a bite with friends and relax and enjoy the views.